It has been a long time since my last book review (which was The Time Traveler’s Wife, over 2 months back). This is not because I have not read any books since then. I have read quite a few, and I have enjoyed most of them. However, I have been hesitant to review them, mostly because, I have been hesitant to rate them. All these years, I had never given much thought to book rating systems, but since I am now reviewing/rating books on a very public platform, I have been wondering about the usefulness and validity of these star based systems. • The rating is paramount. The review is just an extended explanation of the rating. • The review is more important. The rating is just a numerical value that accompanies it. I personally think that stars are kind of meaningless on their own, mostly because everyone utilizes stars in a different way. Some people think 3 out 5 stars is a bad rating, some people think it is a good rating. There are people who rate a significant portion of their books 5 out of 5 stars, and some give them out very rarely. Moreover, while everyone is reasonably clear on what anyone means by a 1 star or a 5 star rating; 2, 3 & 4 stars could mean vastly different things to different people. So, I believe the rating on its own doesn’t tell anyone anything about the book. I put more stock in the reviewer’s opinion, and what they liked/disliked in a book. I might not always agree, but it still gives me relevant information which I can use, to decide about a particular book. This is another common dilemma while rating books – do similar ratings imply similar quality/calibre of the book? The short answer to that is – NO. Here is the thing – I don’t give out many 5 stars, or even 1 star for that matter. My ratings mostly range between 3 and 4 stars, but even they don’t always align, and mean the same thing. For instance – I gave 3.5 stars for Pradyumna, as well as for Outliers. Are both those books of the same calibre? Of course not. They are from 2 very diverse genres, and I had 2 very diverse experiences while reading them. There is no way I can compare the two. But I can say that I pretty much enjoyed them equally – though in very different ways. And while we are on the subject of comparisons, I have to mention one more thing. In the above example, the books are in two different genres, and hence comparison is tricky. But even if we consider only the genre of fantasy – I do not compare every single fantasy book with what the gold standard for a 5 star is (something like Harry Potter). That would drive me nuts! Which is why, if I enjoyed a book, and it worked for me, at the point of time I was reading it- it can still be a 5 star book/series. The most important factor that influences my ratings is my personal enjoyment, which depends on my mood, and the overall reading experience. I really appreciate a well-written book, with strong characters and themes, but I can even enjoy fluff (not elaborating, but you know what this means) when I am in the mood for it. Everything that I read need not be award-winning work of literature. But if I read a book at the wrong time (for me), it doesn’t matter if it is an award winning work of art, I will still probably detest it, and blame the whole literary world for its existence. My point is – my ratings are subjective. Actually everyone’s ratings are subjective. Our feelings and opinions are colored by our experiences, and that makes complete objectivity difficult (if not impossible). Having said all that I have said, I must admit that there are times when I find star ratings helpful – especially when I go overboard in either praising a book, or dissecting and analyzing my criticism of the book – star ratings stabilize things. I can be overly critical and then give a book a rating of 4. And no, it’s not because I have Multiple Personality Disorder, but possibly because I did not hate the book as much. I might have just felt the need to elaborate on what I did not like, in that particular situation, but the book might have had some redeeming qualities that I did not go into detail about. And needless to say – this can work both ways. Do you find star ratings useful? How much do they matter to you? Would it bother you if they are not present in the review? I will go with whatever the majority wants. In case, you guys do want me to continue with the rating in the reviews – I will continue to include enough information along with the rating, and also mention any personal biases which might influence why I liked/did not like the book, and whom the book might be more suitable for. You voiced my opinion Shantala. I don’t think stars are relevant at all in the absence of a review but they do convey your over all opinion of the book. I recently read and rated a Divakaruni book a 3.5. But I really liked it. I had to add in my review that by any other author I’d probably have given it a 4.5 but for Divakaruni who’s other books I’ve enjoyed way more than this one I stuck to a lower rating. That’s not exactly fair at some level but that’s how I see it. Yeah, I totally get it. It is not always fair; the parameters constantly change and evolve, and so stars hold no meaning without a review. 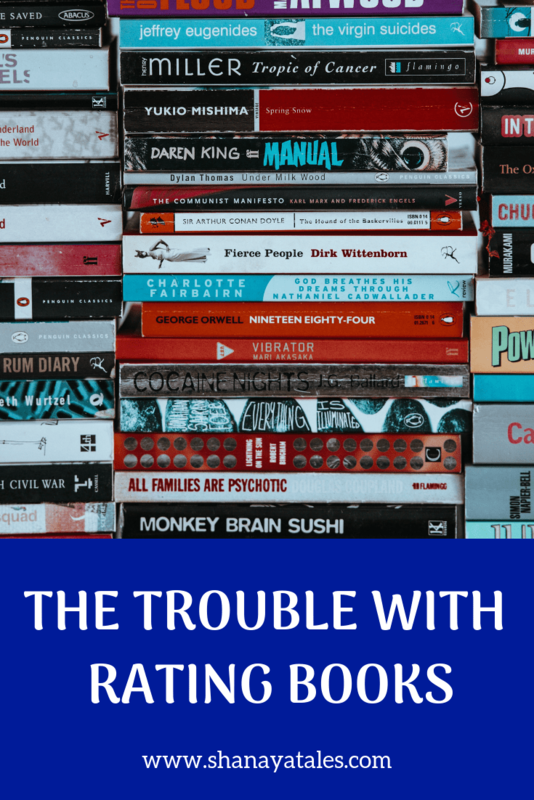 I review books at nandhinisbookreviews. blogspot.com. And believe me, till date I’ve never given a star rating for books in my reviews for the same reason you are talking in the post. When I study the ratings Ive given at Goodreads, I find that the book I’d given 3 stars might be actually better to me than the one I’d given 4 stars. Ratings, I believe, depend on the subjective analysis of the book in that particular moment. Unless it’s Mandatory at places like goodreads and amazon, I won’t use them for reviews. I find myself agreeing with you on the rating system, especially because each reader brings his/her personal experiences and prejudices to the reading experience. And what works for me will never work for you, not 100% of the time, even if we have identical tastes in literature. I also agree with Tulika above where she says that it makes a difference on how the first book of the author appeals to me, one way or another. So that may colour my interpretation/rating of the same. Very true, Shy. It is very subjective, which is why – it holds little to no meaning on its own. However, the collective rating on Goodreads/Amazon is helpful. Shantala, I faced the same dilemma when I started reviewing more consistently. But, the star rating is very subjective. Something that works for a certain genre, I may not like it as I am not comfortable with it. So, why give a poor rating. I have seen some websites giving very detailed ratings like – Character, Dialogues, Story, etc. But, that is again too much. So, I decided to do away with the ratings. Instead, I just mention who may like the book and of course the pros and cons of the book. True. The detailed rating for plot/characterization etc is too much for me too. I can never rate like that; also, I don’t necessarily find any value addition in that as a reader. I find it very hard to rate books on a scale – rating is very subjective. But yes, I do consider them when I want to know about a book, or a movie. Invariably I find that often, my own experience is quite different from the ratings I see. I completely agree that my 4/5 could be assigned for entirely different reasons than yours. 🙂 Which is why, even though I love publishing book reviews, I never do the on a scale of 1 to 5 or 10. I did it just once and have been dying of guilt ever since.. Nice thought-provoking post! In fact, these days I try and only publish reviews of books I loved reading. Yeah, makes sense. They help on a collective level – on sites like Goodreads/Amazon, but do nothing for me on an individual level. Right. It helps when considered along with the review, but has little to no meaning on its own. Rachna recently posted…Do poor human lives matter to anyone? That is true. I feel my negative reviews tell more about my taste, as well as the book; mostly because I try to explain and clarify my stand more. It is quite a situation where I do find myself perplexed on what score to give. But yeah I average it out.. and try as far as possible to think it over and be able to justify the score I give. But as you rightly said, iut is quite subjective. So whats a high score for one, need not be high for another. So thats where a detailed review written makes more sense. True, the rating and review go hand-in-hand. Only review will work, but only rating says nothing about the book. Ratings are subjective, yes. But I do mark it on goodreads and at the end of most of my reviews (not all), I mention the star rating as well. But, the thing is sometimes a 3 may mean two vastly different things, even to me, depending on the book. So, in one of my more recent book reviews, I gave two different star ratings: one on a literary scale and one on a personal (taste-based) scale. I admitted the book wasn’t exactly my type, but also admitted to the sheer genius of it. I gave the higher one on goodreads. It gives people a sort of estimate though they must obviously read my detailed review to know what I mean. Exactly! A particular star can mean completely different things, even to me. I give star ratings on a personal taste scale only. However, I do ensure to mention my particular tastes/biases, and also try to suggest who might like the book (even if I did not). Having said that, there are some books, that are well written, but I would not recommend to anyone, like – Ajaya. The logic doesn’t sit well with me at all, and while I understand some might like it, I don’t want to recommend anything that I feel is misleading. First of all, it was very brave of you to put up such a posting. Rating a book has always been an elephant in the room. To me this whole concept of star and rating are simply the same. I have a system where i rate the story based on narration, characterization, plot and an overall rating. This way it makes the overall rating a bit justified! Star ratings are great for when you are on a website looking for books to read. The number of reviews and and the stars tell you if it is popular. I use the star ratings to narrow my search and then read individual reviews to see what fits. In the reviews you write, star ratings give me a gist of what to expect out of the review. Like if I really want to read a book, and you give it a 2 star, I would read your review to see if the things you didn’t like really matter to me. The points you raised hold true for any creative activity, don’t they? Artistry, cooking, movies… maybe this ambiguity is applicable even to car-and-bike reviews. The presence of star ratings is a good starting point. Unless the book (or app, or movie) has a 4.2-star average rating, I don’t consider 5-star reviews. The 3-star ones offer more honesty and cogency. It’s up to the reviewer to publish her thoughts and rate the object. How the reader interprets it solely depends on the reader, although the reviewer making it clear for the reader is an added bonus. BellyBytes recently posted…Am I ready for the ride of my life? Ummm… got me thinking. Its a mix of both for me. To select book sonline I do see the stars, but I would also cpick up a book if it’s got good reviews. Tricky and cumbersome task, though. lets not even get started on other aspects. One of my friends said he buys books depending on the ‘font size’. Nisha Sanjeev recently posted…Hello Miss! Are you a TM or MTM? On the font size?! Wow! That is a unique way of selection! The ‘rating’ system is one of the reasons why I steer away from reading reviews. I’ve never been a fan of ‘star’ ratings. In fact, on the odd occasion that I do write a review, I usually just go through the pluses and what could be improved – based on my experience, and leave it with a final personal verdict. Sid recently posted…Me time : When’s yours? Thank you so much, Sid. And yes, I find more value in the opinion too; the rating is just a numerical, very inadequate, representation of the review. Great post on making book reviews. I love to read books not based i=on its rating but based on its writing. I agree that two 4 star rated books are also not on the same level. Rating is subjective. But it does help. I immediately reject the 1 star rated and jump on the 5 and even 4 star ones. For the 2 and 3, i read the detailed review to make my decision. So yeah, rating definitely helps!! Yeah, it is the same with me. I don’t give a second thought to the 1 star ones; 4 and 5 – I add to my TBR, and with 2 & 3 – I need more information. I couldn’t agree more on all the points you’ve raised in this wonderful post. 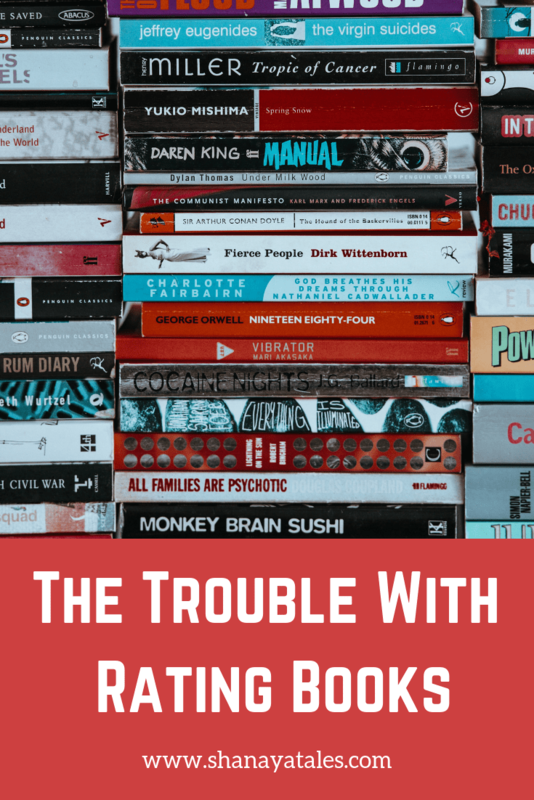 Because I myself do book reviews on my blog, I have at one point had this discussion in my mind to decide if I should (at all) be rating the books that I read. And I decided in favour of ratings. Though I do not rate books 5 stars but I have rated a few 4.5 (that’s my max so far) and yes, I do not shy away from giving 2 or 2.5 stars if the book in my opinion deserves it. Like you mentioned, it is subjective and the overall pros & cons mentioned in the review hold the total weightage. True, Era. The opinion always holds more weight, but I guess the ratings kind of round it off. Not adequate on their own, but I guess they help, when considered along with the review. I agree with you, it is difficult justifying and comparing two books with the same star rating from different genres. Also as you had mentioned in an older review, external factors to influence the readers experience. So one cannot 100 percent validate the rating. I think listing the pros and cons of a book in the review works best for me. A thoughtful post dear friend, dont fret too much, your reviews are always pretty sound and honest! I go through the same dilemma. Though I rate my books, I know what you are talking about. A 3.5 could mean different things for different people. I have started getting away from ratings. Now I just list positives and what could have been better. Your post made me think on the subject. Good one! Sometimes reviews confuse me because they give a book a 2 or 3 star rating but then have nothing but praise in the written part of the review. When I write reviews I struggle to find the right words without spoiling the book for others. Susan Gourley recently posted…It’s Back! I agree with the points you raised. The ratings are very subjective and each person can view it differently but with a comprehensive review it summarizes the overall appeal of the book. I think you review books really well, Shantala. I agree with you, rating points are subjective, which is why I almost never ‘rate’ a book. My reviews are mostly what I think of a particular book, the characters, the plot, etc. Spot on. However, I believe if you are following a particular reviewer the numbers make sense. But they must be taken along with what the reviewer says about the book. Yes, the ratings are not totally useless – they are especially helpful on sites like Goodreads and Amazon, where collective ratings (generally) show collective opinion. For the same reasons I don’t put a star rating when I review books. My review mostly mentions what I liked or did not like about a book only. Totally agree with you that it is subjective. In my case I rate according to my expectations from the genre. Earlier I wasn’t following the rating on my blog, but then felt if someone is looking for a quick verdict star system is good, so added it. But I think both review comments and rating go hand in hand. Anyone who is planning to read a book should look at everything, blurb, reviews, rating cover etc. Yes, I agree with your words of wisdom. Being an author and a reviewer for TBC I can see where you were going with your pointers. Sometimes it hurts to give out the truth but then being an author I have to know that is the way to grow so, ought to embrace it, repair it and move forward. Yeah, every one has their own unique thought process when it comes to rating, so, without the review – it holds little to no meaning! Rating a book is just a crap Shanaya. It can never say what we want exactly. So never believe in the stars when buying a product 😀 Now when my hubby says, its got a good review shall we get it.. my face is like . uh uh.. did you really read the reviews. Recently I was going to buy an app and saw it has all 5 and 4 stars and when I read the reviews, I saw all the negatives regarding the product. So basically. Fault in the stars 😀 Lovely article. I tend to like reading what people had to say about a book more than the number rating. Such an individual thing. It tells me so much more. I will notice the rating but prefer to read the reviews. Also I’m not a numbers person at all and am not attracted to stats of any kind. Give me the words! Great thought provoking post. Well, as a blogger, reviewer and reader of books, I do take a look at the star rating. They are usually indicative of some thing about the book the reviewers might have missed or not written, especially the ones that are not following the norm. Sometimes the stars are misleading but not always. I don’t rate books on my blog review. Sometimes on Goodreads, I skip rating because of various reasons. As a writer, for me, reviews are more important than ratings. I want to know what the reader felt about my writing, characters, story etc. especially (no matter if it’s 1 or 3 or 5 stars). Amazon doesn’t allow you to post review without rating (and vice-versa). But, on Goodreads, people find it easier to just rate the books without writing a single line about the book. That is why they bother to write review on Amazon, perhaps. It bothers me. I strongly believe in rating. Ofcourse it means different things to different people, but that is what it is all about. By rating a book, what I believe is concluding the conversation on a clear note. When common readers approach a book on amazon they merely go with the stars and number of ratings rather than detailed reviews. They may read one or two top reviews, but main focus will be on rating.